Vortex updated the Strikefire Red Dot scope not too long ago. The result is the Strikefire 2 which has some great upgrades from the original model. These upgrades included to shorten the overall size by half an inch, simplified controls and an additional two night vision settings with super-low light requirements. The scope is available with red and green dots or with just a red dot. The price is very reasonable but that shouldn’t fool you. It’s a high quality scope with features and optics that you’ll otherwise find in higher priced models. The Strikefi﻿﻿﻿re 2 is a mid-range red dot scope. Pricing is on the overall lower end making it a very affordable sight for beginners and experienced shooters. The weight is a little on the high side with around 1 pound of weight. Nothing to be concerned about too much but if you shoot often it can feel a little heavy. It measures around 5.6 inches in length and is available with a scratch resistant black finish. The sight is built durable and sturdy and is very easy to use. It comes as a red dot optic with a 30mm objective lens and a 1x magnification. The lens is, as you’d expect from Vortex, of great quality and provides a clear image. Alternative to the red dot, you can also get a model with red or green dot. Both of these versions at the lowest level are night vision compatible. The intensity of the dot can be adjusted in 10 different levels. The overall brightness of the image can also be adjusted in 10 different settings. The sight is also waterproof, fogproof and shockproof. It achieves being waterproof and dustproof by using O-rings. We would probably not suggest that you submerge it. The Strikefire II comes with two flip up lens covers, cloth, CR2 battery and a torque wrench. It does lack some of the advanced features you get in high-end (and higher priced) red-dot sights. For longer distances it would also be a great addition to have some level of magnification. You can get a 1x – 3x magnification by adding the Vortex VMT-3T magnifier (see image on the right) to the sight. This will vastly improve your options for shooting at longer distances! 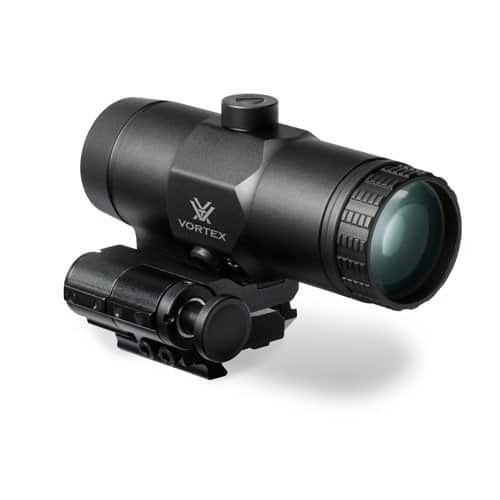 Like every other sight and scope, the Vortex Strikefire 2 does not only have positives but also some cons to mention. Can end up being very heavy depending on the mounting rails. The best place to buy pretty much any hunting or tactical optics is Amazon. The Vortex Strikefire 2 makes no difference. You can get the sight at the best price and it is shipped quickly. The Vortex Strik﻿efire II sight is a great piece of shooting equipment specifically if you are a beginner or intermediate shooter. It can easily be combined with the magnifier to make it an outstanding setup with up to 3x magnification! The sight is great for using your firearm as quickly as you can due to its extremely fast target acquisition capabilities. This makes it a great choice for many tactical and shooting situations at a fantastic price point!